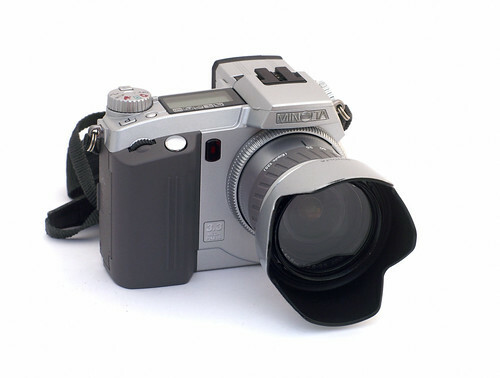 Minolta DiMage 5 is a bridge (SLR-Like)  3.3mpx digital camera, manufactured by Minolta Camera Co. of Osaka, Japan. Lens: Minolta GT 35-250mm (equivalent in 35mm film camera) f/2.8-3.5. The lens is not interchangeable, but gives the feel of a small 35mm SLR. Storage: Compact Flash card or MicroDrive. Metering: TTL metering system selectable to either 256 Segment Metering, Center-Weighted Average or Spot mode. Operation modes: full Program, Aperture preferred automatic, Shutter preferred automatic and fully manual. It also had special program “Scene” modes: Portrait, Sports, Sunset, Night and Text. Viewfinder: Ferroelectric LCD (4.8cm, 71,000 24-bit color pixels) that could be swiveled upwards through 90 degrees, provided a frame coverage of 100%, had diopter adjustment and an automatic mode to detect locality of eye to turn it on. You could see all the information that would normally be displayed on the 1.8 inch TFT LCD on the back of the camera in the viewfinder. Focus: contrast detection, allowing the user to select from 3 "wide area" auto selected zones or a Spot AF - flex focus point (movable focus point). Manual focus was provided by an electronic "focus by wire" ring at rear of lens barrel. Battery: four AA cells of Alkaline, Lithium or NiMH rechargeables. There are high end Minolta accessories such as dedicated flash units and wired remote controls for the camera. ↑ The term Bridge camera means that it fills the gap between the SLRs and the Point-and-shoot cameras. They are often comparable in size and weight to the smallest Digital SLRs, but almost all digital bridge cameras lack an optical viewfinder system (film bridges generally had a lighter version of a reflex finder). In addition, SLRs normally feature interchangeable lenses, while current bridge cameras do not. The term has been in use at least since the 1980s for film cameras, and continues to be used with digital cameras. ↑ Minolta GT lens made up of 16 glass elements in 13 groups, 2 anti-dispersion elements, 2 aspherical elements and multi coated.